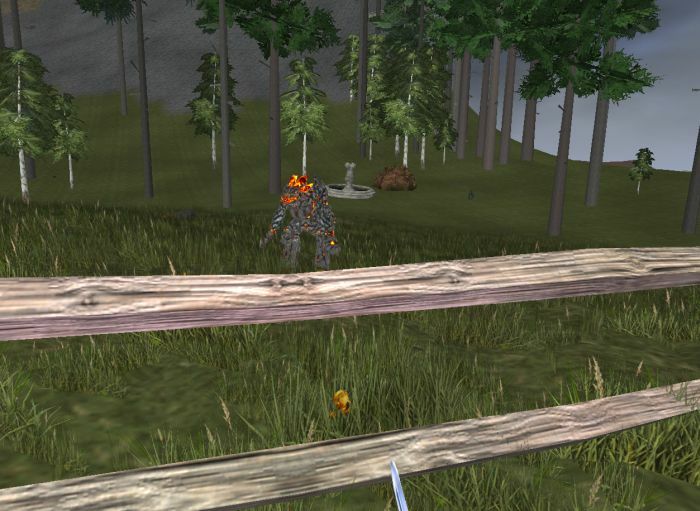 The Great Adventure (Part II) #WurmOnline – Nomadic Gamers, eh! It is 10:17:53 on day of Awakening in week 2 of the starfall of Fires in the year of 1021. The forest is not kind today. For hours I was trapped inside my meager pen, avoiding the smoking lava fiends that chased me from the mountains. My own fault I suppose, as I was poking around their homes. It is hard to resist the lure of an open mine. The lava fiends were not the only dangers out there. Mountain lions, wild cats, and even a young troll wandered past. I don’t recall ever seeing a troll back home, but Arysh assures me they are not as rare as we think they are. Speaking of my dear sister, she came to visit and brought me a few home cooked meals as well as some sprouts to help plant around my temporary home. She knows my gardeners thumb is not nearly as green as hers, in fact I mangled some roots so bad the day before that it’s a wonder we’re related at all. Progress was made, at least. In an effort to affect as little of the natural surroundings as possible I’ve decided to be content with my small home, a food storage bin, and my forge. The broken down remains of the forge were already here long before I and have proven to be quite valuable. I fashioned myself a new file so that I could work on a large cart for hauling, as well as a butcher knife. I can’t have all that precious meat going to waste after all. Things are not completely silent here, and I doubt they are anywhere. Deep within my mountain I can hear the clang of pickaxes reverberating off of the walls, as well as the gentle hiss hiss of the lava fiends who call it home. I must remember I am a guest in this little sanctuary, and treat it as such.